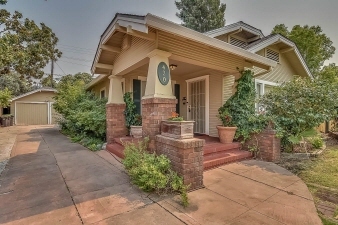 Steps from UOP- Charming Tuxedo Ave home with 3 bedrooms and 1 bath . Nice size yard with a 2 car detached garage. Formal living room with brick fireplace. Formal dining room and also a breakfast nook in kitchen. Huge family room w/ wood beamed ceiling and wood walls , includes laundry area and slider to back patio. Central Hvac. Partial basement . Quaint covered front porch with room for seating! Walk to Miracle Mile Shopping and restaurants!